Coins valued on their numismatic value. We pay very high rates and we don't charge testing or refining fees. Complete our simple form and post it Special Delivery to us with your gold. We'll pay you the day we get your gold by cheque, cash, BACS, CHAPS or PayPal. If we receive your gold tomorrow, we'll pay you tomorrow. The prices quoted are the rates we're paying, we don't charge testing or refining fees. If you change your mind within 24 hours we'll return your items at no charge. Gold-Traders (UK) Ltd offers the simplest and fastest way to sell your unwanted scrap gold jewellery. We also offer what are probably the highest prices for your gold, guaranteed. 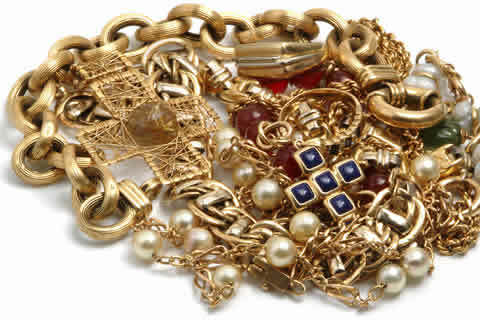 We buy all types of scrap gold jewellery. We're happy to accept almost any type of gold you'd like to send us. It's easy to check the type of gold jewellery we buy. And remember, it could all be bringing in money for you. Why hold on to scrap gold that's broken or unloved? Lots of people have gold rings, jewellery and other gold items pushed to the back of a drawer or hidden away in a forgotten cabinet. The pieces may be unfashionable, unloved or broken – so it seems they're not worth anything. But they are! We can turn your unwanted gold into cash, to use for the things you really enjoy: holidays, new clothes, redecorating, maybe a deposit on that new car. Or perhaps money to donate to your favourite charity. Even just a few pieces of broken gold can earn you a surprising amount. There are so many good reasons to sell gold. Don't leave it lying there, get your old gold to work for you! How do you sell gold? Quite simply, we arrange to have it melted down and recycled. Your unwanted gold jewellery may well go on to form another ring or piece of jewellery, so it can be treasured and enjoyed all over again. It's an excellent, if unusual example of recycling and the best aspect is, we pay you for it. Is it really worth doing? Definitely! Gold has always been a highly prized special metal. And in today's uncertain economic world, its assured value makes gold even more sought after. Check out our scrap gold prices per gram - you could be looking at a very worthwhile return. And we make the whole process easy, quick and secure. Want to sell gold for cash? Apply today. We're currently paying our customers a minimum of £10.93 per gram (9ct) and depending on what you have, it may well be more! See our up-to-date table of scrap gold prices. Worried about dealing with a cash for gold company on the Internet? Read the testimonials left by some of our recent customers.